A designer metamaterial has shown it can engineer emitted “blackbody” radiation with an efficiency beyond the natural limits imposed by the material’s temperature, a team of researchers led by Boston College physicist Willie Padilla report in the current edition of Physical Review Letters. A “blackbody” object represents a theorized ideal of performance for a material that perfectly absorbs all radiation to strike it and also emits energy based on the material’s temperature. According to this blackbody law, the energy absorbed is equal to the energy emitted in equilibrium. The breakthrough reported by Padilla and colleagues from Duke University and SensorMetrix, Inc., could lead to innovative technologies used to cull energy from waste heat produced by numerous industrial processes. Furthermore, the man-made metamaterial offers the ability to control emissivity, which could further enhance energy conversion efficiency. Researchers have long sought to find the ideal “blackbody” material for use in solar or thermoelectric energy generation. So far, the hunt for such a class of thermal emitters has proved elusive. Certain rare earth oxides are in limited supply and expensive, in addition to being almost impossible to control. Photonic crystals proved to be inferior emitters that failed to yield significant efficiencies. Constructed from artificial composites, metamaterials are designed to give them new properties that exceed the performance limits of their actual physical components and allow them to produce “tailored” responses to radiation. Metamaterials have exhibited effects such as a negative index of refraction and researchers have combined metamaterials with artificial optical devices to demonstrate the “invisibility cloak” effect, essentially directing light around a space and masking its existence. Three years ago, the team developed a “perfect” metamaterial absorber capable of absorbing all of the light that strikes it thanks to its nano-scale geometric surface features. Knowing that, the researches sought to exploit Kirchoffs’s law of thermal radiation, which holds that the ability of a material to emit radiation equals its ability to absorb radiation. Working in the mid-infrared range, the thermal emitter achieved experimental emissivity of 98 percent. A dual-band emitter delivered emission peaks of 85 percent and 89 percent. The results confirmed achieving performance consistent with Kirchoff’s law, the researchers report. 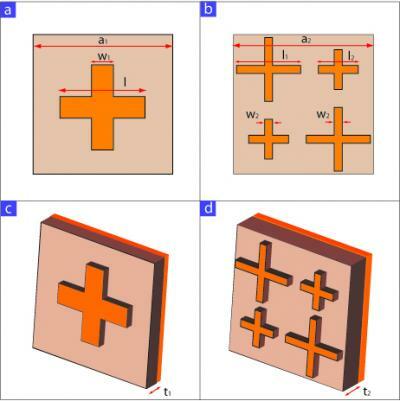 The researchers said altering the composition of the metamaterial can results in single-, dual-band and broadband metamaterials, which could allow greater control of emitted photons in order to improve energy conversion efficiency. “Potential applications could lie in energy harvesting area such as using this metamaterial as the selective thermal emitter for thermophotovoltaic (TPV) cells,” said Padilla. “Since this metamaterial has the ability to engineer the thermal radiation so that the emitted photons match the band gap of the semiconductor – part of the TPV cell – the converting efficiency could be greatly enhanced.